Last week, I had the pleasure of meeting with Professor Kafui Attoh, Assistant Professor of Urban Studies here at the Murphy Institute, to discuss his original spoken word piece “The Bus Hub,” among several other spoken word pieces he created eight years ago. “The Bus Hub” is a brilliantly executed and thoughtfully arranged piece in which Attoh transforms his field notes at a Bus Hub in Syracuse into a multimedia work of art. By setting his field notes to an originally composed acoustic guitar loop, he makes a broad and vibrant observation of this pocket of the Syracuse urban landscape come alive with a bustling energy that should be familiar to most any East Coast city dweller. The litany of bus routes which act almost as a refrain pull the listener into a frenetic and detailed space wherein the narrator and witness transfers his system of record into a report of place, space, character, language, custom and condition. A transcribed version of the “The Bus Hub” as well as other perspectives on this piece can be viewed in the ACME journal. are the bonniest, we call them Hilsa and morola. I wrote a psalm for Jesus while I was sleeping. the light down as if our lives depended on her. 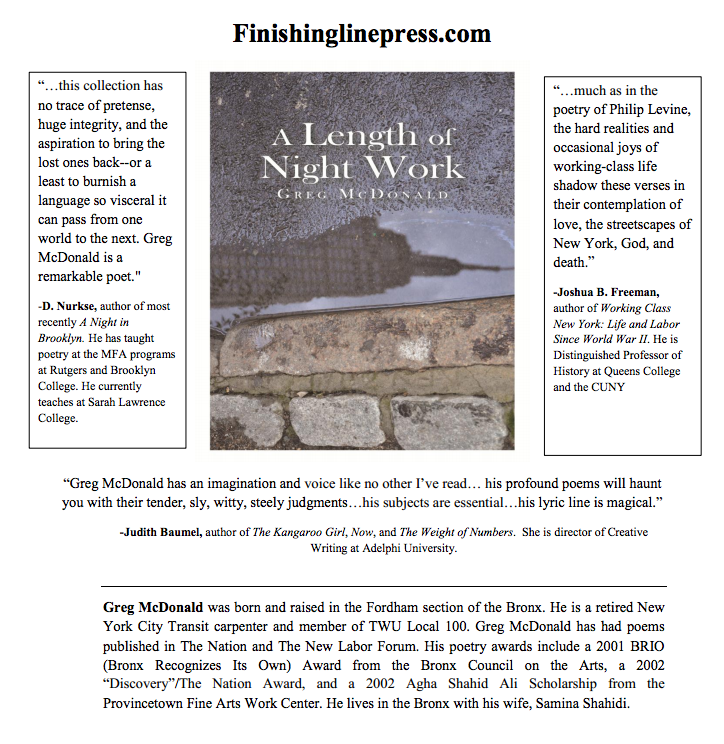 Purchase A Length of Night Work at Finishing Line Press. & says it’s time to go to Yonkers.